This 12 inch stream flare is made from 18 gauge stainless steel for durability and corrosion resistance. Designed to easily fit on the 12" x 60" Gold Well vortex drop riffle sluice box for use in rivers and streams in place of the waterfall head. Note: The High Bank attachment cannot be used efficiently with this stream flare. Attachment of the stream flare to the 12 inch Gold Well sluice is merely a matter of removing the screws holding in the back of the 2 part drop pan in the sluice and installing screws into the obvious locations. The existing adhesive that seals the back of the pan most likely will need to be cut through with a sharp knife and removed. Depending how often you want to change from one type operation to another will determine if you will want to use the wing nuts (included) or not to attach the stream flare. The 'tab' at the front of the stream flare should overlap on TOP of the drop pan in the sluice. 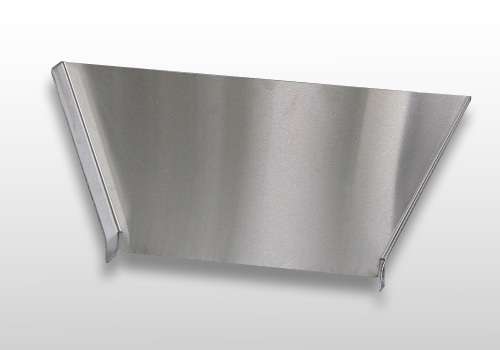 If a water tight seal is needed there you might consider placing a thin sheet of some compressible material between the stream flare and the sluice drop pan, or some thin self-adhesive weatherstrip that can be found at most hardware stores.